With Quick Easy Ketogenic Cooking, nutritionist and popular food blogger Maria Emmerich takes the guesswork out of ketogenic cooking. It's easier than you think to prepare mouthwatering, nourishing ketogenic meals. Quick Easy Ketogenic Cooking shows you how. The ketogenic diet is a way of getting your body to stop relying on sugar for energy. When we get most of our energy from fat instead, something amazing happens—our health soars and extra weight falls off. The ketogenic diet has been used as a treatment for epilepsy for decades, and it also can help treat obesity, heart disease, metabolic syndrome, autoimmune disease, and more. Quick Easy Ketogenic Cooking makes the ketogenic diet simple and accessible for everyone, no matter how busy you are or how much cooking experience you have. Plus, with its emphasis on real, whole foods, it's perfect for anyone following Paleo, and its abundance of nut-free, egg-free, and dairy-free options make it ideal for those with food allergies or intolerances. Plus, an introduction to the ketogenic diet explains how and why it works and how to become a fat burner. There are also tips and tricks for keto success, suggestions for eating keto at restaurants, and six meal plans—two weekly and four monthly—to make meal planning effortless. No matter how busy you are, there is time to eat well. Your health is worth it. Maria Emmerich is hands down the best ketogenic recipe maker on the planet, and Quick & Easy Ketogenic Cooking is the latest example of that. A lot of people pretend to know about keto, but Maria is the real deal. This book arms you with quality information that you can start using right away to change your life forever. You hold in your hands what I consider to be the perfected “ketogenic handbook” for the kitchen. Over the last ten years, Maria's books have been the source of nuts-and-bolts direction for my family and for thousands of my patients, transforming a low-carbohydrate diet into a delicious ketogenic banquet that truly treats the diseases of civilization. 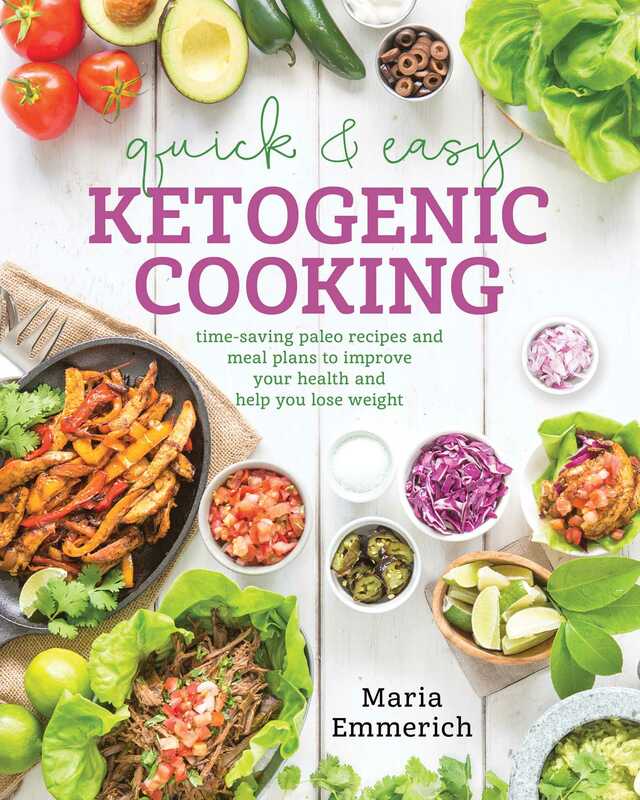 The question I hear most often after I describe the critical importance of changing to a very low carbohydrate, moderate protein, and higher fat diet is, “What’s left to eat?” Maria answers that question expertly and beautifully in Quick & Easy Ketogenic Cooking. She is one of the most experienced chefs in this arena, and her expertise shines through on every page. Quick & Easy Ketogenic Cooking is the bible for ketogenic adaptation. Maria shares a simple way of understanding how helpful and powerful ketogenesis is for everyone. This book is for health practitioners, dieticians, and anyone who cares about health and wellness.